Our kids take packed lunches daily. We do this for a multitude of reasons… Celiac disease which mandates a gluten free diet, dairy allergies which means no milk or milk protein. For two of our children, we end up packing wheat free/dairy free/gluten free/vegan lunches. The other two get wheat and dairy but otherwise vegetarian lunches. Another reason we pack lunches for all our kids is to ensure they eat healthier and so that I can see what they are actually eating on a day to day basis. The leftovers come back home, so they can become snacks. We do spend time brainstorming lunch ideas… the kids never complain but I get bored of packing the same foods over and over. In this lunch box we have: sliced organic pears sprinkled with lemon juice, organic baby carrots, gluten free white rice bread and peanut butter sandwich, Glutino GF pretzel sticks and K-Kritters animal crackers. We finish the lunch off with Chocolate Flavored Almond Milk and an Endangered Species Dark Chocolate Square (certified GF/Vegan). For the non-gluten free kids, we use the same foods in wheat containing versions. We find that the kids classmates are always interested with what is in their boxes and the kids are happy to eat their colorful (and healthy) lunches. Including a small treat (like the small chocolate square) makes them excited about opening their lunch. When I was pregnant, I was so sensitive to auto fumes that I couldn’t drive on the Chicago interstates during rush hour. The fact that pregnant women are so sensitive to fumes seems like an indication that it can cause some harm to the little one. I enjoyed reading your post and admire you for not only packing 4 lunches a day but catering to food allergies. That is great you pack lunches using a waste-free system, we use a Laptop Lunches for our 4 year old and a Happy Tiffin for our 6 year old–both waste free lunchboxes. 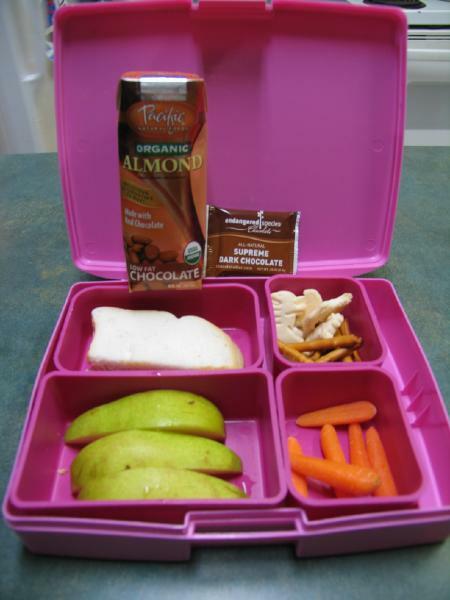 Please visit my blog for more lunchbox ideas! This is great. Do you have any more ideas? Never realized that you can buy individual servings of almond milk! My son’s getting tired of tortilla chips at lunch. And I’m worried about him having soy milk every day. Do you mind telling me where you got it? We just learned that in addition to a milk allergy, my son has a wheat, peanut and egg allergy. Trying to come up with what this child will take to lunch every day at school!